Space-X has been the subject of a few recent updates and analyses. This is a review of that information, and an original analysis of the financials, their planned satellite constellation, and competitive analysis. Elon Musk has announced that the “Block 5” version of the Falcon 9 rocket will be launched by the end of 2017. This will be the final refinement of the Falcon 9 booster design. Block numbers are typically the equivalent to version numbers. They are used with spacecraft because often, there is only one version and copy of a space vehicle made. Each new copy is also a new version, in many cases. Each successive block number is generally more capable and less expensive than the previous ones, because the means of production already exist. With Falcon 9, the 29 flights so far fall into four major blocks. The first stage booster will be reusable “at least 10 times” and potentially “indefinitely”. The new boosters will also be much easier to return to flight between launches. Space-X have done a lot of engineering groundwork on what it takes to re-fly these boosters with minimal maintenance, rather than just recover them intact. There is no substitute for actually doing something, in this case returning a booster to flight, in terms of testing and optimizing procedures. The hardware itself has been refined to be low maintenance and easy to inspect between flights. The legs are improved. Considering one of the landing failures was due to a leg folding up when weight was put on it, this makes sense. They have already landed on a drone ship in very rough wind conditions. It was probably also refined to make it easier to return to flight. Space-X currently removes the legs of the Block 4 boosters after recovering them. Given the size of these landing legs, simplifying that step should make the return to flight easier. The thrust is improved. The thrust has gone from 7607 kN to 8451 kN. The change in payload capacity has not been announced. We can’t realistically do an “all else being equal” equation to estimate the new payload capacity. As with any engine, increased thrust usually means decreased fuel efficiency. Space-X has increased thrust with every version of the engine, and increased the payload dramatically as well. Analysis: With those caveats in mind, if the average ratio of thrust-to-payload continues as before, Block 5 would have an expendable payload to LEO of 25,000 kg. The only vehicle that is larger currently is the Delta Heavy, at 28,790 kg to LEO. Space-X has stated that in the near future, all first-stage rockets will be recovered. If a launch requires too much fuel to recover the first stage on a Falcon 9, it can be launched on a Falcon Heavy instead. With the current Block 4 version of the Falcon, a rocket that recovers the first stage can only deliver 42 percent of the payload of an expendable stage to Low Earth Orbit. (This is still 9600 kg, versus 9000 kg for the expendable first generation Falcon 9). Recovering the first stage on a geostationary launch reduces the payload to 64 percent of the expendable version. Over the last year, Space-X has successfully landed seven booster stages. While Space-X has focused primarily on delivering payloads to orbit, these demonstration flights with the Block-4 prototypes have done two important things. First, they proved that the software and hardware could handle the challenges of propulsive reentry and landing. Second, they provided intact specimens of flown hardware for the Space-X engineers to study. Imagine two people are designing unpiloted gliders. One person throws gliders over a cliff into the ocean and gathers as much information on their flights as possible before the gliders crash into the water, never to be seen again. The other person launches and recovers the gliders, and is able to examine the skeleton and skin of each one to find stress points, worn parts, or overbuilt systems. In the past, all first stages were discarded in the ocean. Now, we have actual flown hardware in a hangar, not just streamed data from telemetry. They can examine the flown stages in mechanical detail and refine the designs. They have even taken one and pushed it past the reentry limits, then had it land successfully (and unexpectedly). So in addition to conventionally stressed stages, they have one pushed past its limits to fill out the far end of the analysis graphs. The landed stages of Block 4 will only be re-flown a few times at most to gain both more stress data and more confidence in the turn-around process. There is also the old adage in manufacturing, “At some point, you have to shoot the engineer and cut metal.” Engineers have a tendency to want to keep refining a design as long as possible. Meanwhile, the business must eventually settle on a single design to put into production. Otherwise, the company will fail because they will never make anything except prototypes. So now the engineers have both flight-proven hardware and their ongoing wish list from before and since the stages were recovered. This combination of additional time to development and testing feedback has given the engineers an treasure trove of real data and ideas to work with in designing the Block 5. 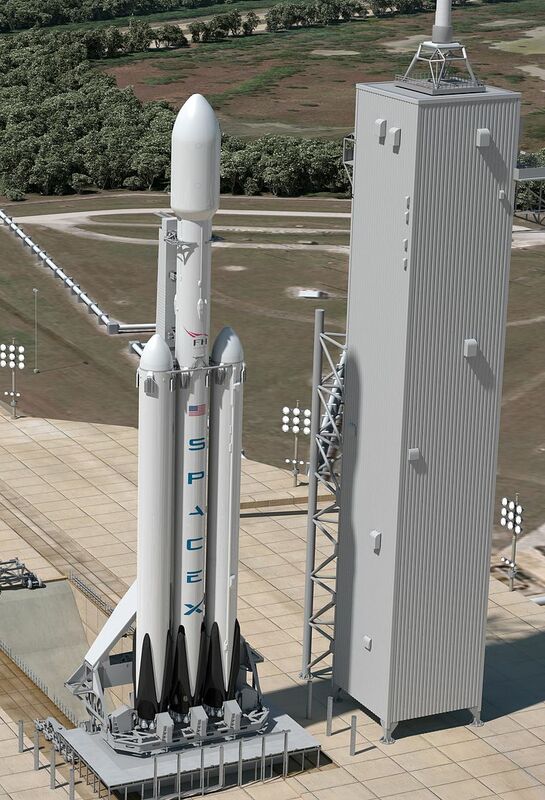 According to Wikipedia, the Falcon Heavy, if expendable, could carry up to 54,400 kg to LEO, or 22,200 kg to GEO. If the core stage is expended but the side stages are recovered, the payload to GEO is 14,000 kg. That said, the method for increasing the payload this far when the Falcon Heavy was detailed a few years ago was the concept of fuel cross-feed. The side boosters would feed fuel to the core booster engines during ascent. This would drain the side tanks faster, but leave the fuel in the core tanks mostly available when the side boosters separated. By jettisoning the weight of the side boosters earlier in flight, and carrying more fuel to a higher altitude and speed than would otherwise be possible, this method would dramatically increase the payload. Space-X has recently stated that the cross-feed won’t be used on the first flights. There really is no need for it in the near term, because there are no commercial payloads heavy enough to require it. Red Dragon, or the capsule to Mars in 2018 2020, may not need it either. Elon Musk has stated that, in general terms, for every four MT you can get to orbit, you can get two MT to GEO or one MT to the surface of Mars. Analysis: The Red Dragon capsule is estimated to weigh 6.5 MT. So the LEO-equivalent payload capacity would be 26 MT. That is exactly double the mass of a GEO flight with the side stages recovered but the core stage lost. Therefore, if all the sources are correct, we could see either fuel cross-feed or an expended core stage for the Red Dragon launch on the third Falcon Heavy flight. If schedules keep slipping, we may see it launched on the second flight to meet the Mars launch window, which only opens every 26 months. The Wall Street Journal recently did an article on Space-X and their revenue potential over the next few years. The general gist of the article is that Space-X cannot afford any more launch failures in 2017, because the two in 2015 and 2016 set them back so far financially. They are also running on very thin profit margins. This makes it very difficult to recover from a launch failure due to lost income during the return-to-flight investigation. The launch market available for Space-X is roughly $1 billion per year now, and raises to $5 billion by 2025. That said, Space-X intends to start launching a large constellation of small communications satellites over the coming decade. This would allow small antennas the size of a piece of paper to give broadband satellite internet access anywhere in the world. The goal is an additional $30 billion in revenue per year from this system. This has a lot of implications. The cost per customer would be too great to compete with terrestrial systems in most areas. Existing systems for use in non-urban areas, such as Hughesnet satellite internet in the US or Iridium for satellite telephones, is very limited and fairly expensive. According to the WSJ article, the satellite company would have 40 million customers and bring in $30 bilion in revenue by 2025. Simple division sets that per customer monthly price at $62.50, at up to 1 Gbps per user. Hughesnet charges $50/month for one tenth the speed, and cannot scale anywhere near one Gbps. It also has far greater latency due to the satellites being much farther away (Geosynchronous orbit). Hughesnet is also limited to a customer base of rural users who cannot get broadband any other way. This market is also becoming increasingly rare – even very rural homes can typically get DSL or terrestrial radio broadband now. That said, any customer who lived inside a large apartment building or condo without roof access would not be a customer. Anyone with faster terrestrial or (by then) 5G cellular systems would also have no use for the system. That’s fine. 40 million customers is around one sixth of one percent of the world’s population. It also has a lot of room for growth. Here are some speculative versions of satellite internet system. Portability: The Space-X antenna is the size of a sheet of paper. We could see a future laptop system with a fold-out antenna along the back of the monitor – either as a shade for the monitor, or as a kickstand, or just passively off the back. It may require external power, or its own battery pack. Alternatively, the whole thing – battery, antenna, and modem could be a secondary box the size of a tablet computer one would carry with them in the same case when needed and leave home when unnecessary. Eventually, the antenna could be integrated into the laptop itself or a laptop protective case. It could have a fold-out solar array to recharge, or to help charge a laptop/tablet when not in use. This would be ideal since the antenna would need to be near a window or outdoors to reach the satellites. Future Miniaturization: A new generation of more powerful satellites, along with better antennas, could mimic the trends with GPS receivers. My first GPS had an antenna the size of a man’s thumb and needed to be outdoors to work. Modern GPS systems, complete with radios, can fit in dime-sized packages. We may also see terrestrial augmented systems that automatically switch to licensed wi-fi in larger buildings. Bundling Power and Communications: Musk has a tendency to use his technologies and companies together to complement each other. Maybe Solar City’s new tile solar arrays with satellite receiving antennas will be bundled into the system. I could see that pushed out to rural and remote areas as a combination of power and communications in a single ecosystem. Bundling Tesla and Communications: On a similar note, Tesla vehicles could easily have such a system embedded in the roof of the cars. There would be many advantages to a car that could communicate at gigabit speed from anywhere in the world. It could receive software updates anytime the car is driving or parked outside. Tesla’s satellites would also double as a navigational system, which could compliment GPS. With two way communications and detailed navigation data, it could provide information on new roads, traffic issues, and travel times in real time, similar to Google or Apple systems. It could also do so without access to cell phone towers. With satellite radio and Netflix/ Hulu/ Amazon/ etc. access to children’s entertainment, it could also replace Sirius-XM and augment back-seat entertainment systems. I suspect there will be a low-bandwidth, low cost version of the receiver specifically to compete with Sirius-XM. It could give higher quality audio on demand for the same price as a satellite radio subscription (Sirius-XM is currently $20/month, and each channel is 4 to 64 Kbps). The hypothetical audio system would work anywhere in the world, like GPS. Customers would only pay for what they listened to, when they listened to it. Competitors to Tesla could license the automotive satellite systems from Tesla. This would increase the Space-X licensing revenue for automotive manufacturers and the customer base for the systems dramatically. With concept cars being more and more connected, a system like the Space-X satellite constellation would become more necessary over time. The satellite network would be expanded around the time that luxury cars will have more self-driving features, so this combination of entertainment bandwidth and automotive applications may be ideal. There is a very real risk that Space-X could have one or two more launch failures in the next 2-3 years. If this happened, the company may not survive. There are several reasons this is unlikely in the near and medium term. The Block 4 issues have been analysed and the Block 5 has applied a lot of lessons in terms of reliability. ​The growing pains for the Falcon 9 should be largely resolved. The next risk categories for Space X will be Crew Dragon and Falcon Heavy. Analysis: Google has kept its Project Loon system in progress (which involves high altitude balloons that circumnavigate the globe on winds). It has cancelled its high altitude drone program. It has its own satellite constellation concept, but it ALSO has invested $1 billion in Space-X. Google’s business model is to give communications and data collection tools away, then harvest the data for marketing. Putting money into Space-X gives them a spot at the table for analyzing Space-X data. Having investment in both a Google constellation and a rival constellation gives them a monopoly on data coming from the systems without necessarily invoking anti-trust laws. Peter Thiel makes the point in the book Zero to One that Google is functionally a monopoly in the business of pretending it isn’t a monopoly. This strategy of being in two places at once (both as Google and as Google’s competitor) would be true to form. Microsoft once invested $150 million in Apple to keep it from going under. The motivation to invest in a direct competitor that they had largely crushed was primarily to keep anti-trust laws from breaking up Microsoft. We may have seen this repeated with Space-X and this $1 billion investment, which may have saved them during the two launch failure recoveries. We may see it again if Space-X hits another failure in the next two years. Once the constellation is operational (at 800 satellites), we have the “raving fans” dynamic coming into play. Anything Musk touches has a certain halo effect for his fans. While companies like Apple can push products to all income brackets, Elon Musk fans aren't so lucky. Your only purchase options are mission patches and other curios from the Space-X company web site, or a Tesla coffee cup. Anything of substance from Space-X or Tesla will cost $35,000 or more. For a typical Musk fan to finally be able to afford a Space-X product instead of simply reading about them guarantees a large early-adopter market. This could push early revenue past the “valley of death” phase of recovering investment and into profitability. As with the Tesla Model 3, we may see a vast quantity of pre-orders for receivers. As noted before, there is also a ready automotive market and a marginal home market built into the Musk, Inc. ecosystem. In the long term, what are the competitors to Space-X in terms of launch provision? Here is a short list. Reaction Engines - Skylon: A recent study that indicates that Skylon’s air-breathing, advanced spacecraft simply cannot compete with Space-X at any scale or volume. It can come very close, but it cannot actually cross that line, even in optimistic models. The unit cost is simply too high, and the demands of each launch too complex. It remains an interesting vehicle for military applications and research. It may still find a role in the long run, particularly with any payloads that may be sensitive to G forces on launch or return. It may also be subsidized like other European aerospace projects to be commercially viable even when the technology is too expensive for purely commercial viability. ULA - Vulcan: Since the system requires the purchase of not just fuel, but a replacement first stage tank for each launch, this doesn’t seem a practical competitor. There is also the expense of mating the recovered engines to the new tank, testing of connections, and so on. While ULA has decades of experience in producing reliable rockets, these will be new challenges on lower budgets. That said, the ACES upper stage has a lot of potential as a space tug, and could be adapted to the Blue Origin system due to the close ties between ULA and Blue Origin. ULA – Atlas: It appears that the same factory in Russia that makes the engines that keep failing on Proton and Progress upper stages makes the RD-180 that powers the Atlas V rocket. They have been found to be using sub-standard metals on some engine components. The vaunted “100 launches, 100 percent success” statistic seems less predictive than it was until now. Blue Origin – New Glenn: This is a very serious contender with deep pockets and a strong business plan. We do not have any actual payload numbers for this rocket, but it has the potential to do what Space-X is doing, only in a mid-range between Falcon 9 and the planned ITS. This may nibble at the market for launches on the Falcon Heavy. But as I’ve noted before, customers who may not have put all their eggs in one basket by developing payloads that can only be launched by Falcon Heavy may be more inclined to do so if there is a back-up launcher from an entirely different provider. The reverse is also true for Blue Origin. We may see a frenemy relationship build over the next two or more decades where having two providers expands the market for both companies beyond what they could have had alone. It also could make “50 MT the new 20 MT” in terms of ideal cargo size. ULA – Delta: Delta Heavy is currently the biggest booster in the world, but rarely used because it’s very expensive. Having Falcon Heavy and New Glenn in this payload range will increase the number of heavy payloads looking for launch vehicles. If costs on those heavy payloads creep up during development to where the risks of using a newer booster are outweighed by the consequences of launch failure, we may see Delta Heavy continue as an operational vehicle longer than expected. That said, it cannot continue indefinitely as the Mercedes in a parking lot of Volkswagens. More frequent launches by New Glenn and the Falcon 9 will make them more reliable, and less frequent customers for Delta will make the manufacturers and ground crews less proficient over time. The crossover will ultimately force the Delta into retirement.